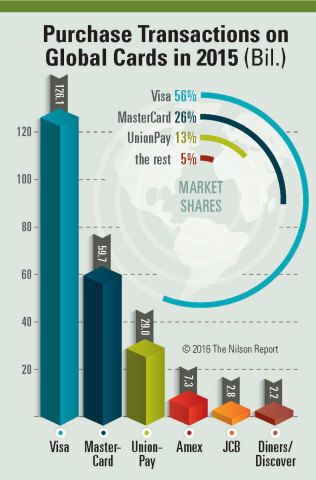 CARPINTERIA, Calif.--(BUSINESS WIRE)--Global general purpose cards carrying Visa, UnionPay, MasterCard, JCB, Diners Club/Discover, and American Express brands generated 227.08 billion purchase transactions at merchants in 2015, an increase of 16.1% over 2014, according to The Nilson Report, the top trade newsletter covering the card and mobile payment industries. Purchase transactions included all commercial and consumer credit, debit, and prepaid cards. Visa cards, which include both Visa Inc. and Visa Europe, accounted for 55.52% of all purchase transactions worldwide. Debit cards with the Visa brand continued to account for the most purchase transactions with a share of 35.50%, followed by Visa credit cards with 20.02%, MasterCard credit cards with 13.14%, MasterCard debit cards with 13.13%, UnionPay credit cards with 6.79%, UnionPay debit cards with 6.00%, and American Express cards with 3.21%. JCB cards with 1.23% overtook Diners Club/Discover cards with 0.98%. Commenting on the results, David Robertson, Publisher of The Nilson Report said, "When consumers worldwide reach into their wallets for a payment card, more than half of the time, they use a Visa card." Credit, debit, and prepaid cards in circulation totaled 10.25 billion at the end of 2015, up 8.2% over year-end 2014. UnionPay accounted for 53.07% of global brand cards in circulation, up from 52.09%, followed by Visa with 28.95%, down from 30.23%, MasterCard with 15.35%, up from 14.96%, American Express with 1.15%, down from 1.18%, JCB with 0.91%, down from 0.93%, and Diners Club/Discover with 0.56%, down from 0.60%. The Nilson Report is the most respected source of news and analysis of the global card and mobile payment industries. The by-subscription-only newsletter provides brand, issuer, acquirer, and vendor statistics not found in any other trade journal, as well as concise vendor, personnel, and product updates. The Nilson Report does not accept paid advertising of any kind. There are no advertisements, no articles written by vendors, no sponsored content. Contact Lori Fulmer at lfulmer@nilsonreport.com for a complete copy of Global Cards 2015, or download it now. The report mentioned here appears in the April 29, 2016 issue of the newsletter. The Nilson Report releases results for global credit, debit and prepaid cards 2015. Purchase transactions, purchase volume, and number of cards in circulation are included.